Sometimes, having a wedding can seem unnecessarily eccentric and wasteful. The average American wedding produces 400-600 pounds of trash- that’s about a billion tons of waste each year. This waste includes food, flowers, paper products. All this waste seems silly when you think about how much money is spent on these items! If this seems crazy to you, know that it doesn’t need to be this way! You can have the wedding of your dreams, and be mindful of the waste you are creating. There are plenty of ways we can reduce the waste generated by your wedding. 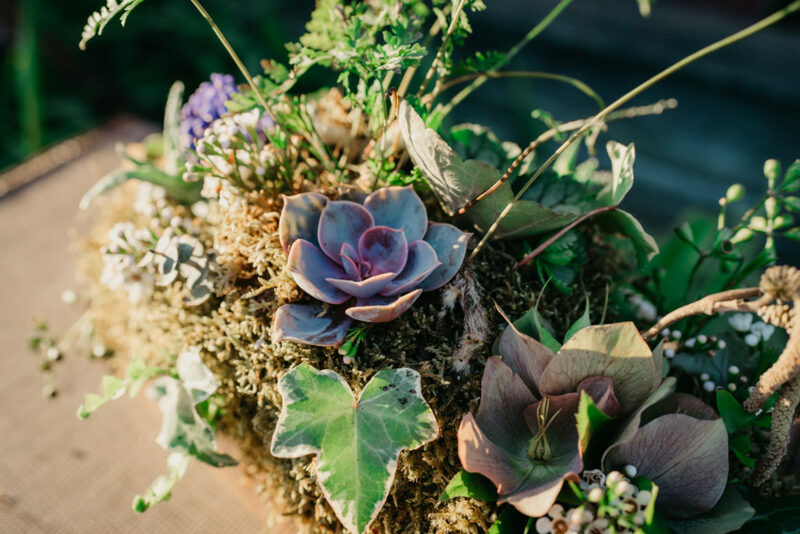 Whether you want to reduce the environmental impact of your big day, or just want to feel like your money isn’t being tossed in the trash, I would love to help you in planning your sustainable wedding! Locally sourced botanicals from Cary florist Springwell Gardens. Invitations- Go paperless! Or print on recycled or sustainably sourced paper. Food- Work with your caterer to provide local or organic food. At the end of the night, have leftovers boxed up and table scraps composted. Flowers- There are tons of options when it comes to your sustainable flowers! Go fake, to create something you can keep forever. Bonus points for creating bouquets out of recycled materials. If you want real flowers, try potted plants, or arrange to have your flowers do double duty and donate to a hospital at the end of the night. Favors- Choose something consumable that won’t end up in the trash. Or opt out of “favors” entirely by making a donation on your guests behalf to your favorite charity. Decor- Rent your decor or purchase second hand. You can do this with your attire as well! Emily Katherine Events is proud to work with CompostNow to reduce the amount of wedding waste ending up in landfills!